Soniclean SFC-7000 Soft Carpet Upright Vacuum. The Soniclean SFC-7000 is specifically designed for Soft carpet. Regular vacuums can get bogged down by super plush, soft carpets. One of the main reasons for this is that the suction of traditional vacuums makes it hard to move the vacuum. So, for regular vacuums, super strong concentrated suction is great for regular carpets, but not so for softer carpets. Soniclean has designed this vacuum with an Adjustable Vent System to make for much easier maneuvering on soft style carpeting. In addition Soniclean uses special soft nylon brush roll bristles which are gentle on plush soft style carpeting, and large front wheels which will allow the Soniclean SFC-7000 to “float” over soft carpeting. The Soniclean SFC-7000 is one of the recommended vacuums of soft carpet manufacturer Mohawk as well as other carpet manufacturers. Designed to be used on Soft Style Carpets such as SmartStrand®, Silk®, Caress®, and Soft Spring®, and also regular carpet and hard floors. Soniclean SFC-7000 Features: The vacuum uses sonic technology (12,000 sonic vibrations per minute) which will help to loosen deep, ground-in dirt and dust from your carpets. This vacuum is ideal for thick or soft carpeting. The Soniclean SFC-7000 has an extra long 35 foot cord, a jam sensor will automatically turn off the vacuum. The vacuum can lay flat to clean under under chairs, tables, and beds. Uses Soniclean Seal-Tech® HEPA vacuum bags which provide 99.97% filtration at 0.3 microns. Brushroll on/off switch built-in to the handle when vacuuming hardwood floors, Full bag indicator. The Soniclean vacuum comes with a Five year motor and one year parts warranty. Soniclean SFC-7000 Cord Length: 35 feet. Vacuum Warranty: 5-year motor, 1 year parts. Smart-Review Commentary: The Soniclean SFC-7000 Soft Carpet Vacuum, is one of the only ones designed specifically for soft style carpet. It has an adjustable venting system that prevents it from getting stuck on the carpet, and big wheels to glide over the softer plush carpet. Traditional vacuums can get stuck on soft carpet due to concentrated suction, which this vacuum solves. This model has an extra long 35 foot power cord, weighs only 10.5 lbs., and uses Soniclean’s patented sonic technology to vibrate our dust and dirt from your carpets. 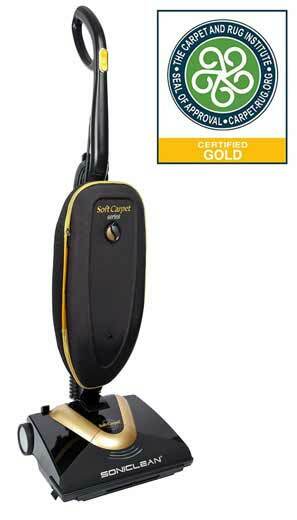 This is one of the most recommended vacuums by carpet manufacturers for use on soft carpets. Certified Gold by The Carpet and Rug Institute. This model was developed with carpet manufacturer Shaw Industries for their soft carpets. The Soniclean SFC-7000 has received excellent consumer reviews and is a Smart-Review top pick in the bagged upright vacuum category for soft carpets. Description: The Soniclean SFC-7000 is designed to vacuum soft and dense plush carpeting. 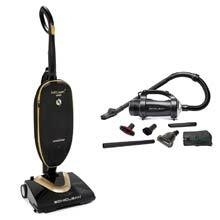 This lightweight vacuum has large wheels, and an adjustable vent system to prevent suction lock on dense carpet. HEPA bags keep the air clean as you vacuum. This well designed vacuum is a SmartReview.com top pick.